The Hillsborough County City-County Planning Commission recently recognized 16 projects for their contributions to the quality of life in Hillsborough County at the Planning Commission’s 50th Anniversary Celebration and 27th Annual Community Design Awards. The Florida Department of Transportation, City of Tampa, and the Federal Highway Administration were among the Award of Excellence recipients for the Interstate 4 Historic Preservation Mitigation Project in the category of Historic Preservation/Restoration. Beginning in 1987, the Florida Department of Transportation (FDOT) and the Federal Highway Administration (FHWA) developed a master plan for much-needed interstate system improvements in Hillsborough County. After every effort had been made to minimize and avoid adverse impacts within the Ybor CityNational Historic Landmark District, 10% of the nearly 1,000 historic buildings would still have to be cleared to widen I-4. After almost three years of research and negotiations between federal, state and local agencies, a Memorandum of Agreement was signed in late 1996. The methods for minimizing the impacts were unprecedented in their magnitude and included the relocation of 64 historic buildings, with FHWA and FDOT being responsible for the rehabilitation of 35 of the buildings within the proposed highway footprint. Twenty-six of the buildings chosen for relocation as part of the Tampa Interstate Study project were located on the north side of I-4 in the most desolate part of the neighborhood. The single-family homes were moved to vacant lots within a five-block area, sited carefully to recreate the historic streetscapes. 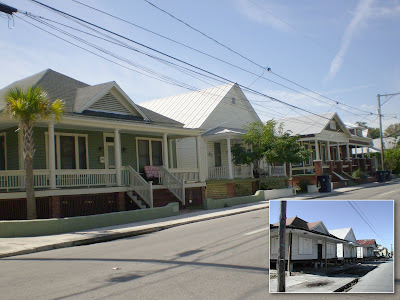 Design plans were reviewed by both the Florida Division of Historic Resources and the local Barrio Latino Commission and typically included rebuilding of deteriorated front porches, replacement of inappropriate windows and doors, new metal roofs, and structural repairs. Low walls, typical of the area, were constructed at each relocated site with plaques stating the building’s original location and date of relocation. Interior renovations removed modifications that had subdivided many homes into multi-resident units and to accommodate contemporary living requirements for kitchens, baths and closets. Once rehabbed, FDOT transferred ownership of the buildings to the City of Tampa, which then sold the homes to private individuals for appraised value. As a result of the project improvements, there has been a noticeable increase in private investment in the surrounding area, both from long-time owners now choosing to improve their homes and rental units and from outside investors purchasing vacant commercial and residential property. Five historic homes were part of the “Las Casitas” project and moved to land near the Ybor City State Museum, south of I-4, where the 7th Avenue commercial district is located. One two-story “camel back” house was relocated to a vacant lot adjacent to the State Museum and now houses the Museum Gift Shop, giving the Museum a larger street presence and allowing for expanded merchandise offerings. The other four homes were placed on an adjacent vacant block flanking a relocated brick commercial building to replicate a historic streetscape. These retail shops are rented by the Museum’s not-for-profit support organization to generate revenue for Museum programs. Preservation Resource, Inc. has been honored to have worked on this project with FDOT and FHWA personnel along with with project coordinator Elaine Illes of IPI and cultural resource consultants from Janus Research along with local renovation contractors, South-Co, Goldsborough and Semco. Congratulations on your hard work, talented wise design work and community recognition!